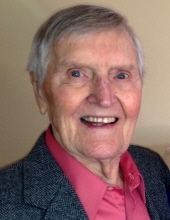 Otis H. Sonnenberg, 94, died on November 27, 2018. He was born October 21, 1924, in Henry County near Holgate OH, to Theodore and Amelia (Badenhop) Sonnenberg. He grew up on a farm in a family with seven siblings, and attended a one-room school for the first six years of his education. He married Lois Jean Benzino October 23, 1948. He is survived by children David (Annette) of Bowling Green, Daniel (Beth) of Wilmington NC, and Peggy Anne (Gary) of Alpine NY. Also surviving is sister Ruth (Donald) Groll of Caledonia MI. He was preceded in death by his parents; three brothers, Reinhold (Eleanor) of Holgate, Julian (Lorraine) of Holgate, and Willis (Ruth) of Lehigh Acres FL; three sisters, Laura (Archie) Gerken of Hamler OH, Rufina Sonnenberg of Lehigh Acres FL, and Julia (Robert) Mangas, of Holgate. His grandchildren are Ella Fleming, Bonita Springs FL, Libby (Garrett) Eiholzer, Stanley NY, Stephen Sonnenberg, Wilmington NC, and James Sonnenberg, Wilmington NC. One great grandchild, William David Fleming, lives in Bonita Springs FL. The Sonnenberg's loved music, and the Sunday evening family tradition was gathering in the parlor to sing while Amelia (their Mother) accompanied on the pump organ. Otis also played a reed accordion in a country-western band with two brothers and several neighbors. They frequently entertained at the social functions of the Huber country school. In 1936, the rural schools in Henry County were consolidated and all children were bused into the Holgate school system. Otis graduated from Holgate High School in 1942 with a State Farmer Degree in Agriculture, and joined his father on the family farm operation. He joined the Navy in WWII, and was trained as an electronics technician. After his discharge he pursued his interest in dairying on a farm near Holgate. He later became sales representative for The Surge Dairy Farm Equipment Co., selling and installing elevated picture-window milking parlors for dairymen who were expanding their herds. He had a keen interest in education and was the president of the Holgate School Board until 1965 when he moved his family to Bowling Green OH, where he was employed by Bowling Green State University as textbook buyer in their bookstore. He found interaction with students and faculty especially rewarding and remained an employee of the University until his retirement in 1988. He was also secretary of the Bowling Green Exchange Club, a service organization that helped foreign students who attended BGSU become comfortable in the Bowling Green community. Otis was a lifelong active member of the Lutheran Church, serving as a Sunday school teacher and superintendent, senior choir member, chairman of Church Council and Goals for Nineties, and a participant on search committees for pastor and organist. He and his wife, Lois, especially enjoyed teaching a new disciple/member class for numerous years. This process helped prospective members find an area of service in the church that best utilized their particular gifts and talents. Otis maintained a love of the outdoors, enjoying landscaping and flower gardening as a lifetime hobby. Family tent camping was a vacation pastime, and after retirement Otis and Lois travelled extensively throughout the US, Canada, Europe, and the Caribbean. Humble, kind, and joyously optimistic, Otis always felt his life turned even better the day Lois took a second look his way. Theirs is a love story for the ages. Visitation will be held on Monday December 3, 2018 from 4:00 to 8:00 p.m. at Dunn Funeral Home, located in the Historical District of Bowling Green at 408 West Wooster St. A Celebration of Life Service will be held on Tuesday December 4, 2018 at 11:00 a.m. at St. Mark’s Lutheran Church, 315 S. College Dr. Bowling Green, Ohio. Pastor Rob Spicer will officiate. Additional visitation will be held Tuesday morning at the church from 10:00 a.m. until the time of the service at 11:00 a.m. Private interment will take place at Oak Grove Cemetery in Bowling Green where full military honors will be rendered by the Wood County Honor Detail. Memorial contributions may be made to the St. Mark’s Music Ministry, St. Mark’s Lutheran Church, 315 S. College Dr, Bowling Green, OH 43402. To send flowers or a remembrance gift to the family of Otis H. Sonnenberg, please visit our Tribute Store. "Email Address" would like to share the life celebration of Otis H. Sonnenberg. Click on the "link" to go to share a favorite memory or leave a condolence message for the family.